I realize that it's been quite a few days since I last posted some Mail Art! Didn't want you to think I've been lazy or anything- so here's a few pieces I've sent out recently. Front & Back of an envelope- sent to Taradactyl of SendSomething. Mystical lunar whale piece of mail sent to a mystical herbalist friend. Mail Art that integrates two of my favorite themes: Whales and Owls! Sent to Chelle of SendSomething. First up, a handmade postcard for a swap I'm in. The recipient has an affinity for vintage ephemera and Hershey Pennsylvania where she live (bottom of the card is a picture of Hershey). Get this- she said that sometimes the Hershey factory made the WHOLE town smell like chocolate! That is up there with Willy Wonka magic! Envelope made to hold a Tea Time ATC (see below) I made for a swap. The Recipient loves Harry Potter (ME TOO!!!) So I themed her envie and her ATC Harry Potter-style. An Enchanter's Tea Party ATC. Mail Art Postcard sent to a fellow Mail Artiste. Looks like you're having fun! 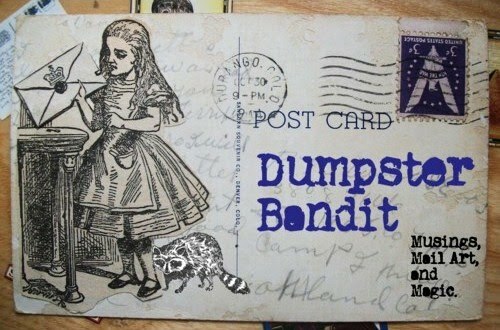 I love mailart land it is the place that I can go to free myself from the mundane. Happy d-diving!! My Inbox of Old- or last week anyway. Holy Smokes, I've hit the Mother lode!